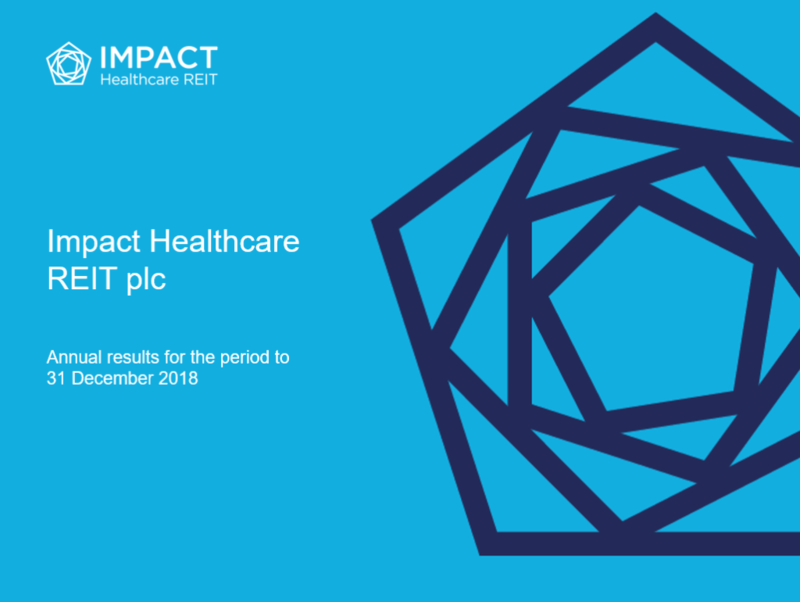 Impact Healthcare REIT plc (ticker: IHR), the real estate investment trust which gives investors exposure to a diversified portfolio of UK healthcare real estate assets, in particular care homes, is today reporting its full year results for the year ended 31 December 2018. Please see the attached document for the full RNS release. · Paid dividends of 6.0p per share in respect of 2018, in line with target. · Our dividend was well covered by our EPRA earnings per share. Adjusted for rent smoothing and one-off items, our dividend was 85% covered by adjusted earnings. 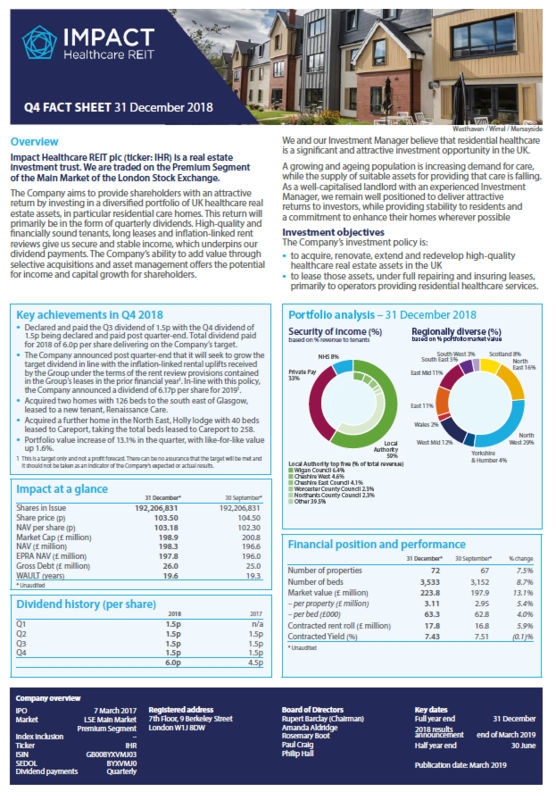 · Portfolio valuation increased by 43% during the year, reflecting £55.4 million of acquisitions, £4.7 million invested in capital improvements and a value uplift of £7.6 million. The value uplift was largely driven by rent increases and the Group’s investment in capital improvements. · NAV total return for the year of 8.5%, composed of a dividend of 6.0p per share and 2.5p per share growth in NAV. · Signed a £50 million debt facility during the year, with £26 million drawn at the year end, resulting in an LTV ratio of 11.6%. · Acquired 15 care homes with 830 beds, adding four new tenants. · At the year end, committed to £15.4 million of capital improvement programmes since IPO, which will add 188 beds to the portfolio. 96 beds of these were completed and in operation by 31 December 2018. · Weighted average unexpired lease term (“WAULT”) of 19.5 years at 31 December 2018. · Rent reviews in the year added £0.5 million to contracted rent, representing a 3.95% increase on the associated portfolio. 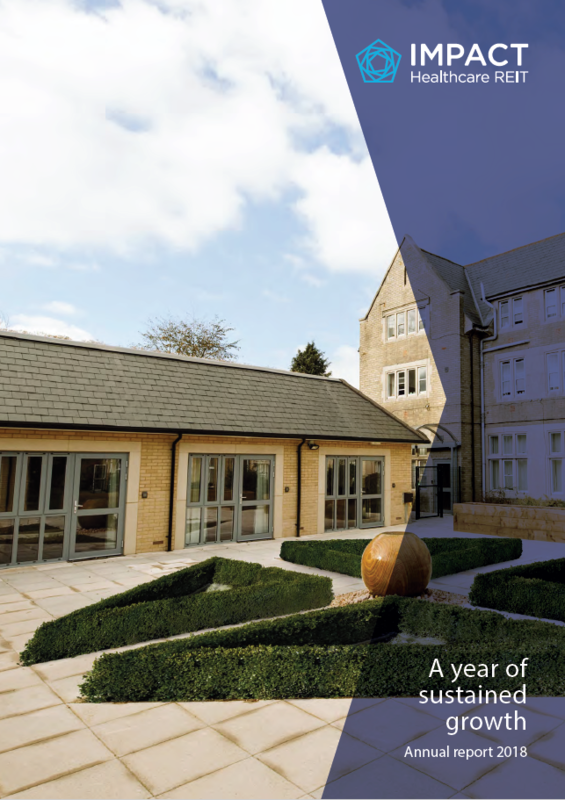 · Completed the acquisition of the Yew Tree care home, adding a further 76 beds to the portfolio. · Launched 12-month placing programme in February 2019, enabling the Company to issue up to 200 million new ordinary shares. · Moved from the specialist fund segment to the premium segment of the London Stock Exchange main market. · Agreed an additional £25 million, five-year revolving credit facility with Clydesdale Bank, increasing the Group’s total facilities to £75 million. · The Investment Adviser, Impact Health Partners LLP, received the authorisations required from the FCA to replace Carne Global AIFM Solutions (C.I.) Limited as the Company’s AIFM. This took effect on 15 March 2019. Impact Healthcare REIT plc is a real estate investment trust (“REIT”) which aims to provide shareholders with an attractive return, principally in the form of quarterly income distributions and with the potential for capital and income growth, through exposure to a diversified portfolio of UK healthcare real estate opportunities, in particular residential care homes. The Group’s investment policy is to acquire, renovate, extend and redevelop high quality healthcare real estate assets in the UK and lease those assets primarily to healthcare operators providing residential healthcare services under full repairing and insuring leases. The Group has now declared or paid seven quarterly dividends of 1.50 pence per share since IPO on 7 March 2017. The Company will seek to grow the target dividend in line with the inflation-linked rental uplifts received by the Group under the terms of the rent review provisions contained in the Group’s leases in the prior financial year. The Company is listed on the premium listing segment of the Official List of the UK Financial Conduct Authority and was admitted to trading on the Main Market for listed securities of the London Stock Exchange in February 2019. 1 Period from the Company’s IPO on 7 March 2017 to 31 December 2017. 2 Adjusted earnings per share reflects underlying cash earnings per share in the year. The adjustments made to EPS in arriving at EPRA and Adjusted EPS are set out in note 10 of the Group Financial Statements. 3 This is a target only and not a profit forecast. There can be no assurance that the target will be met and it should not be taken as an indicator of the Company’s expected or actual results.